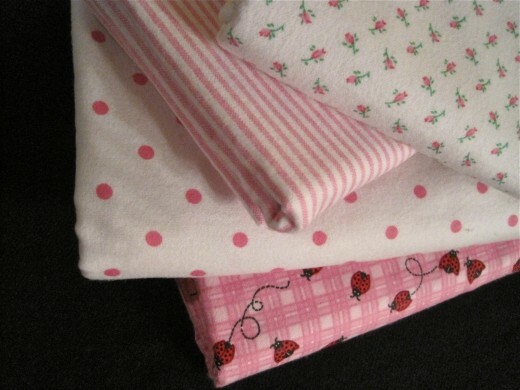 The trip to my fabric store to pick up flannel for this project resulted in my coming home with four happy pieces of pretty pink softness--enough to keep me smiling for a while. Putting a sweet edge on a flannel baby blanket is a great beginner's crochet project, as well as an easy and useful gift to make. Although this blanket is lightweight, is offers some serious help to mothers, babies, and little girls practicing their mommying skills. Especially nice for southern babies since heavy blankets are not often needed in such a climate, these durable “bankies” are usually around for years, initially taking care of real babies, then doll babies. I’ve just given my daughter the first of these crochet edged blankets I ever saw, handmade with love out of solid yellow flannel and given as a gift at her birth. Yes, it’s a little worn, but I still remember the day my dear aunt tied the corners in knots to make a sun covering for her little head at Walt Disney World. • Read through all directions before beginning. • Follow directions carefully if you are a really laid back person, but if you are a type A personality don’t get stressed. While carefulness is important, you don’t have to be too picky. • After washing, completely dry the flannel in a dryer in order to shrink the fabric, otherwise your crocheted edge will be crunched after the new mom washes it the first time. 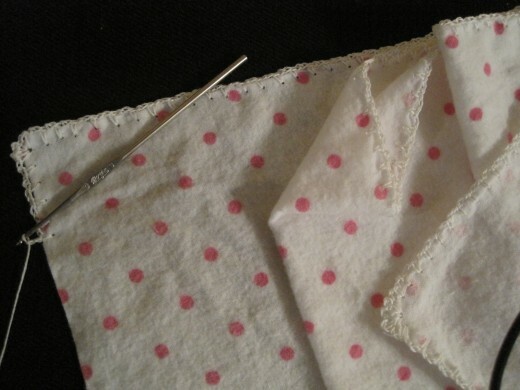 • Do not stretch the edges of the fabric--not when folding, cutting, or crocheting. • A steel crochet hook works very well for this project. • You will be cutting a strip of flannel off one side. 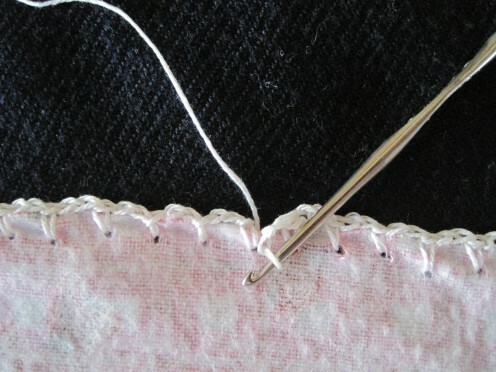 You can use part of that strip to practice your first edging stitches. • You will be piercing the fabric with the crochet hook. Practice doing this gently and you will quickly learn to go through the woven fabric as opposed to breaking the threads in its weave. You will get a feel for how the hook slides between the woven threads right through the fabric and you will learn to work fast once you take a few minutes to practice the technique. Important : Practice not stretching the cut fabric edge as you practice piercing the fabric and making the crochet stitches. 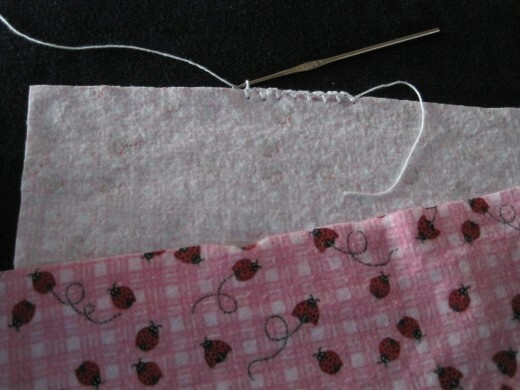 • The fabric edge will likely roll a bit as you work your stitches over it. • To seal the knot at the end of your project use one of the products that keep fabric edges from fraying--after the product dries the knot may be a tiny hard spot, but it softens when washed. • I may have missed something that will become obvious to you. If you have a question please leave it in comments and I will try to answer it. The pink prints shown in this hub's pictures were chosen for my crochet edged blankets to celebrate the new life of a precious granddaughter. While they are not particularly elegant, these simple blankets are invaluable assets. They have a wide variety of uses because of their absorbency and size. In a pinch they make great mop ups for a sticky baby as well as thirsty towels for a clean one. From diaper to raincoat, these lightweight, easy care darlings are a must have. Wash and dry your flannel fabric. 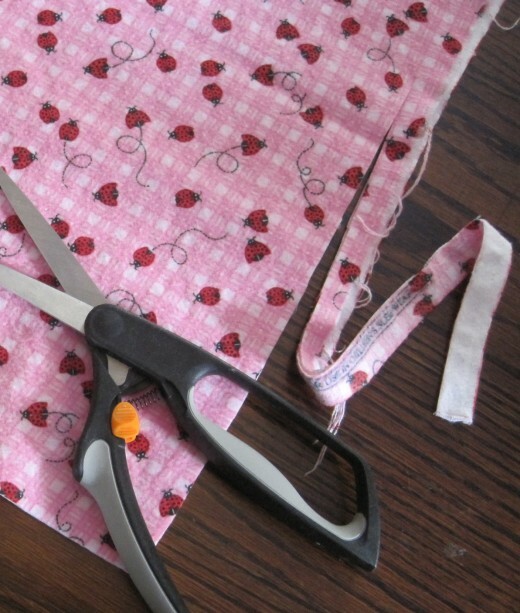 Fold fabric into a triangle so that one cut edge lines up just inside one selvedge. The other cut edge and selvedge will not line up. Lay the triangle on a flat surface and make sure that the triangle for this crochet project is evenly folded. The first cut is just on the outside of the selvedge and cut edge that are lined up. The second cut is made just along the inside of the other selvedge. You might like to set the wider piece aside for a future project (hub coming soon). Once the cuts are made it is time to begin crocheting your edge. 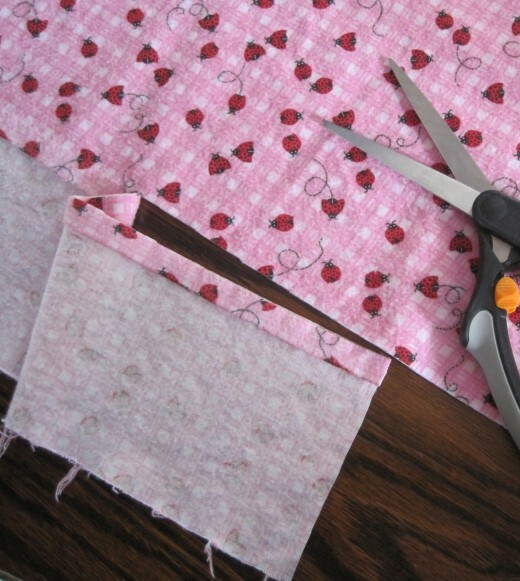 Begin with inside of fabric facing you at approximately 6-8 inches from one corner. Make a regular starting crochet loop and gently but firmly pierce the fabric at approximately 3/8 of an inch from the cut edge, that is a little more than 1/4” but not quite 1/2”--I’m fighting my type A here. 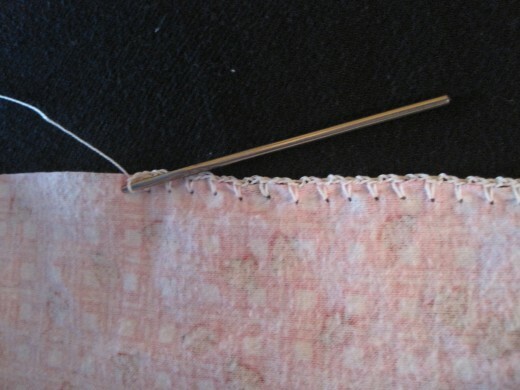 As you work your edging across the fabric these punctures do not have to line up perfectly, just close. Remember, do not stretch the cut fabric edge as you work. (step *) Crochet 3 single stitches and pierce the fabric again at approximately 1/4” intervals, repeating to the corner. (step **) At the corner repeat the crochet 3 single stitches process three times, going back into the same hole each time, gently making the stitches round their corner. With a little practice you will soon have the feel of this technique--don't worry, it's easy! After crocheting around the corner, continue to the next corner and repeat (step *) and (step **) all the way around the blanket. After crocheting around the blanket connect the last chain of single stitches into the very first hole you began with. 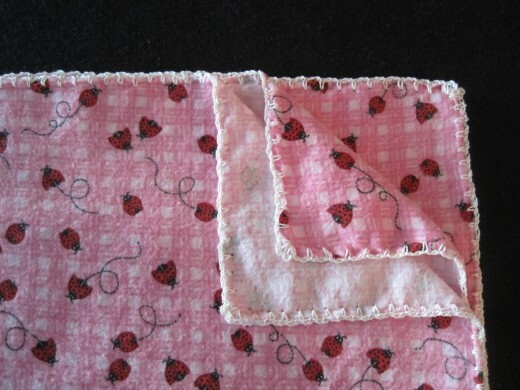 Gives a simple edging to a blanket is a fun and fast project. This one is best for a bright, casual print. Let me know if you make this project! Be sure to look for an upcoming hub with information about more crocheted blanket edgings. Is crochet a hobby you want to begin learning? • Number 3 in this crochet series offers more on the flannel baby blankets edged with cotton thread. 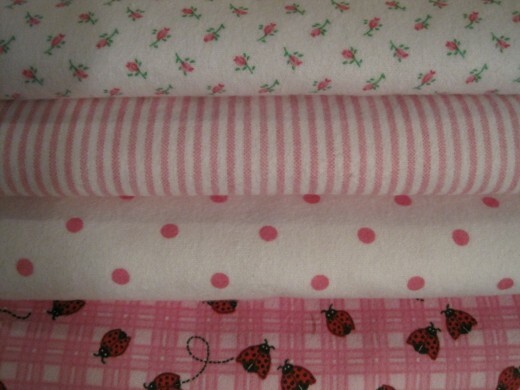 • Number 4 in reviews the blankets and has a special addition to make for baby. 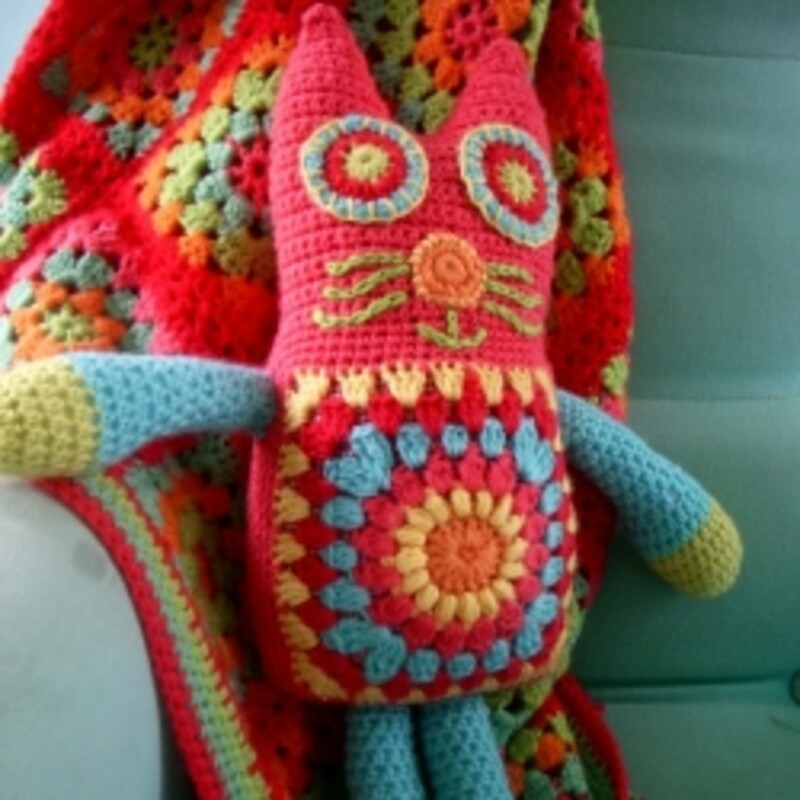 • Crochet Amigurumi Cat Patterns for beginners. Expand your creativity and inventivness via the art of crochet. • How to Find Free Crochet Patterns via this resource list of free pattern links. • Crochet Pattern for a Baby Boy Scarf and Mittens Set makes up a beautiful gift. 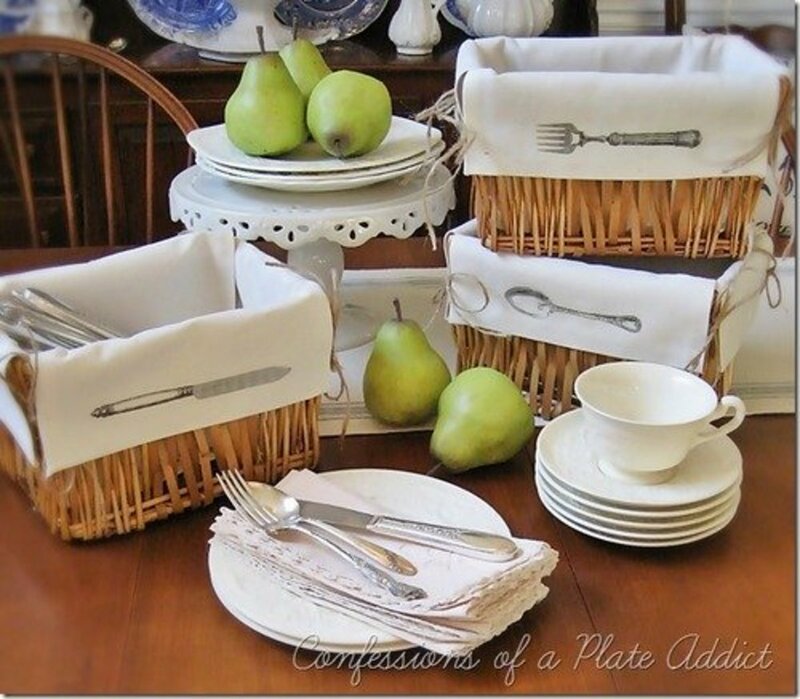 • Make Crocheted Table Runners and other useful home decorations. • Pattern Resource for Crochet and Knitting projects. • Crochet Communities allow you to hang out and learn from other crocheters. If you are a beginner, learning your way through the art of crochet, Amigurumi will expand your creativity and inventiveness. If you enjoy crocheting, find some sites which offer some of the best free crochet patterns. 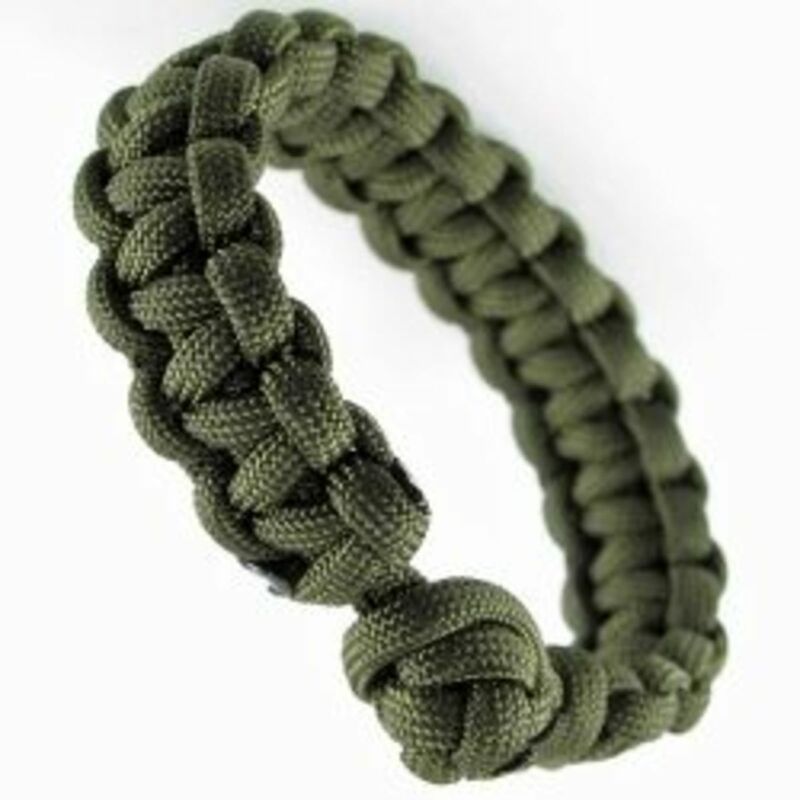 These sites hve hundreds of free pattern links. I had not thought of using seersucker to make one of these but it would be a great summer blanket. I think I would use a light to mid-weight cotton thread with that fabric, but I have no experience with it to be able to tell you for sure. 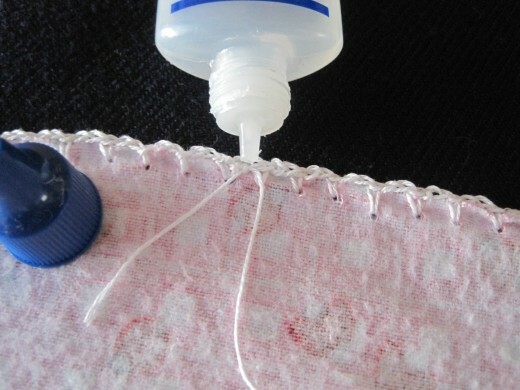 You might like to do a little experimenting with thread weights before you decide. Thanks for checking out this hub on crochet edged flannel blankets. So glad you enjoyed this idea and that the hub inspired you. Hope to see some of your work sometime. Thanks much for coming by! Happy New Year to you! This is a great idea. I used to spend a lot of time crocheting blankets, but they take so long. My kids love the flannel blankets that their Nana had sewn, but this is a great way to combine the crochet and the flannel. I love it and am inspired. So glad this was helpful to you! I've always wondered how to add crochet edgings to cloth. Thanks for this hub! I'm trying to focus on getting projects in order and ticking them off so I can get them out of the way. If we're not careful the stack up becomes overwhelming! Thanks much. :) If you write about your project let me know so I can link it here! What a great idea! I will have to try it! Thanks bunches for stopping in with your comment. This is a great how to hub! I will bookmark it for future projects to start. Thanks so much! So glad you stopped by and found the hub helpful. Would love to see your project when is is finished! Thanks much for leaving your comment. Oh, I know you had such fun doing his little wardrobe! Maybe you can do a hub and show us your work! Thank you for stopping by and commenting. I hope you can pick up the craft again and show off your new projects in a hub. I was thinking about staring to crochet again. I made all my sons baby clothes. I'm getting ready to post a new one that I've almost finished. Hope to see your projects in the future. That is so pretty! I think I might be able to do it: I learned how to do some basic crochet a long time ago, and now that the temperature has dropped into the low teens, I think I want to learn to make a blanket again! Thanks for the tutorials! Glad you enjoyed the project. Thanks much for stopping in. So glad you enjoyed this hub! Thank you for stopping by and for commenting. Yes, this example is only once around the blanket. This hub is an example of a very simple edging. 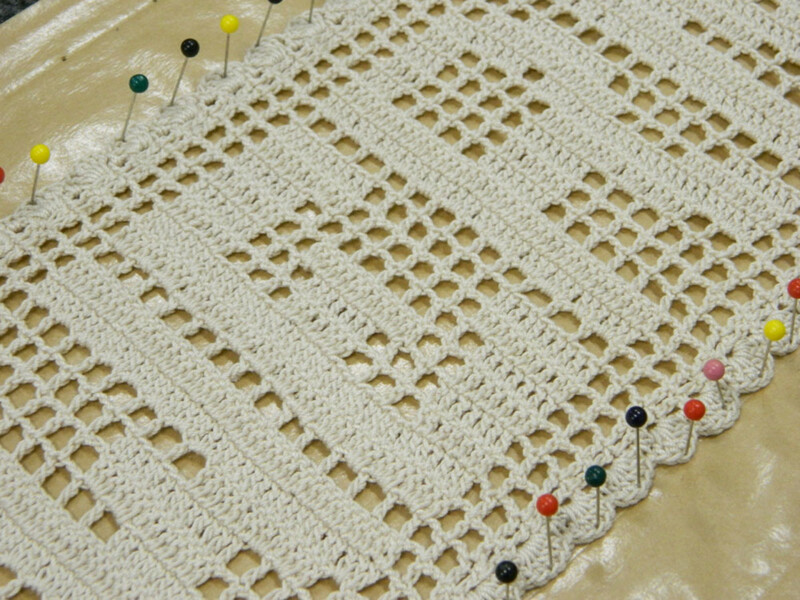 Number 3 in this series is an example of a fancier crochet edging. You might like to take a look at that rather than continue with this same single-crochet stitch. You can go to the hub for Number 3 by clicking on the link just above these comments or by going to my profile by clicking on my name beside my kitty's photo. I love to crochet and am always looking for something a little different (and not too difficult). This was fascinating. One question: did you go around the blanket only once? Could you go around twice to make the edging a little bigger? Thank you so much for stopping in and commenting. I'm getting a hub ready with instructions for a really pretty, yet simple edging. They are a lot of fun to experiment with once the techniques are learned. Maybe you show us some of your handiwork for your new little one. I really like the edging on this - so elegant. I have a grandchild due to make a grand entrance in February - so this winter I will be working on just such lovely projects. Thanks a lot! Oh, and in addition to be called 'Nana' - I've decided to be called 'Super Nana' - yay! Rated up!